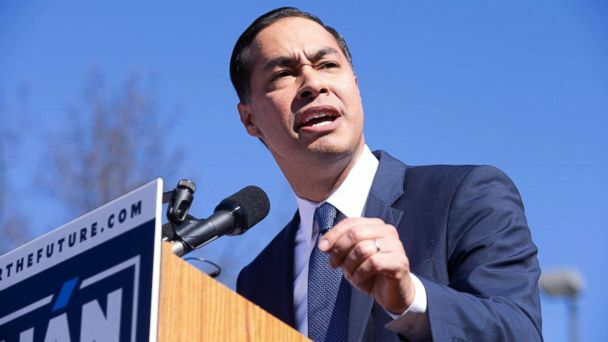 SAN ANTONIO, Texas -- Julian Castro, former mayor of San Antonio and housing chief during the Obama administration, formally announced on Saturday that he is seeking the Democratic nomination for the 2020 presidential election. "Today we're falling backwards instead of moving forward. And the opportunities that made America, America are reaching fewer and fewer people," he said, flanked by his wife Erica and children Carina and Cristian in San Antonio's Plaza Guadalupe, among a crowd of a couple hundred people. "That's why we are here today. Because we're going to make sure that the promise of America is there for everyone." Introduced by his mother, local activist Rosie Castro, he said the country was going through a crisis of leadership under President Donald Trump. "I'm running for president because it's time for new leadership, because it's time for new energy and it's time for a new commitment to make sure that the opportunities I've had are available for every American," he said. Most of his speech highlighted his family's immigrant history and San Antonio roots - his grandmother moved to the United States in the 1920s and his mother is a longtime community activist. Castro described the American Dream as not being a "sprint or a marathon, but a relay. My story wouldn't be possible without the strong women who came before me and passed me the baton. Because of their hard work, I have the opportunity to stand here today." Castro is the first Mexican-American and first San Antonio native to seek the White House. "My family's story wouldn't be possible without a country that challenged itself to live up to the promise of America. That was the point of the American Dream: It wasn't supposed to be just a dream. America was the place where dreams could become real, but right now, the relay isn't working," he said. Asking for an America that is the "smartest, healthiest and fairest" nation on Earth, Castro touted his support for universal health care; pre-kindergarten for all, based on a program he sponsored as mayor of San Antonio; affordable higher education, criminal justice and immigration reform, and more attention on combating climate change. He said that if he is elected, his first executive action would be to recommit the U.S. to the Paris Climate Accord that President Trump abandoned last year. Castro had harsh words for president Trump as the nation focuses on the ongoing government shutdown over Trump's insistence to build a border wall. "Yes, we must have border security, but there is a smart and humane way to do it. And there is no way in hell that caging children is keeping us safe," he said, telling the crowd his grandmother died regretting that she wasn't able to say goodbye to her mother when she left Mexico for the U.S. in the 1920s. Acknowledging that his run for the White House was a long shot, as a growing number of high-profile Democrats are expected to enter the race, Castro referred to his hometown of San Antonio. "There are no frontrunners born here, but I've always believed that with big dreams and hard work, anything is possible," he said. Introducing him, his mother told the crowd Castro is "not one to be underestimated." In response to Castro's announcement, a spokesman for the Republican National Committee called Castro one of the "biggest lightweights to ever run for president," saying he was a weak mayor and questioning his tenure as Housing and Urban Development secretary. "This is obviously just another desperate attempt to become someone else's running mate," said RNC spokesman Mike Ahrens in a statement. Castro faces a growing and diverse primary field as more Democrats jump in on the race. Just hours before Castro's announcement, Sen. Tulsi Gabbard of Hawaii teased a presidential run on Twitter and launched a campaign website. She told CNN in an interview set to air Saturday night that a formal announcement is imminent. On the eve of the new year, Sen. Elizabeth Warren, D-Massachusetts, formed an exploratory committee ahead of a potential run. She headlined several events in Iowa last week and is in New Hampshire this weekend - hitting two early primary states that are seen as barometers for presidential nominees. These announcements come as former Vice President Joe Biden and Sens. Kamala Harris of California, Cory Booker of New Jersey and Bernie Sanders of Vermont - the 2016 primary challenger to Hillary Clinton - mull potential runs and tower Castro in name recognition. But it's most likely the possibility of another Texan running for president, former Rep. Beto O'Rourke, D-Texas, that could overshadow Castro's prospects. O'Rourke catapulted to the national stage during his longshot campaign to unseat Republican Sen. Ted Cruz last year. He may have lost by 3 points, but his road trip campaign earned him comparisons to a young Barack Obama. O'Rourke is set to embark on a solo road trip around the country later this month - and is making a stop in New York City Feb. 5 for an interview with Oprah Winfrey. A decision on a run could come as soon as next month. Castro's next stop and his first trip as a presidential candidate is to Puerto Rico. He'll be in New Hampshire this Wednesday at the traditional "Politics and Eggs" breakfast, which has become an obligatory stop for presidential candidates.